Canon Marketing (Thailand) Co.Ltd, the leader of Thailand’s inkjet printer market for 17 consecutive years, announces the latest success of its ink tank system printer range, Canon PIXMA G Series, which generated sales of as high as 138,696 units in 2017, surging by 166 per cent from 2016. More continuity with a wider ink absorber for smooth printing performance. More convenient with a dedicated button for One Touch Wireless Connection. Better output delivering up to 7,000 colour document pages and 6,000 black-and-white document pages with high-quality inks for crisp text and solid colours. More fitting with integrated ink tank system in well-designed body for varied printing environments. 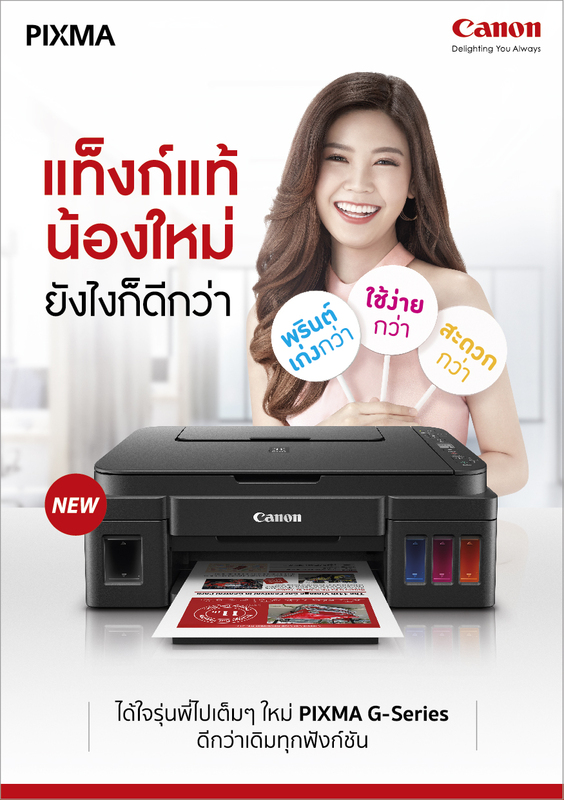 Canon also launches a new TV commercial with the theme of “The Newer, The Better”, comparing its new printers to a newcomer who is packed with exciting abilities, to show Canon’s readiness to advance further into Thailand’s ink tank printer market this year.